The legend of the American West is woven from the lives of millions of rugged individualists, who made their way there to live freely. 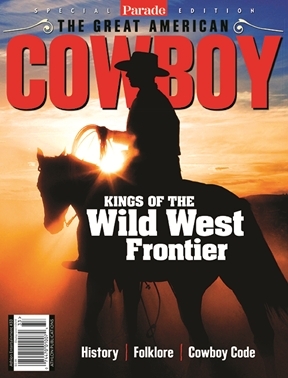 However, of all the West’s iconic characters, the cowboy is the most universally recognized and admired. Through vivid prose and rare, historic photos, THE GREAT AMERICAN COWBOY will tell the story of these brave and skilled pioneers. The reader will also learn about the cowboy code and culture, their lingo, and the fascinating guns, horses and tools of their trade. To anyone with an interest in the Old West, this special will indispensably recreate its drama, iconography, atmosphere and cavalcade of unforgettable characters.